Soft, luxurious and high maintenance—these are the first few of the things that come to mind when people think of cashmere. While this delicate fabric does require a bit of attention, don’t let that stop you from upgrading your wardrobe with a few cozy cashmere pieces. If you clean, dry and store your cashmere properly, it’s easy to keep it in excellent shape. Take a deep breath and let us guide you through the process—it’ll be pain-free, we promise. Yes, it’s possible to clean your cashmere at home. 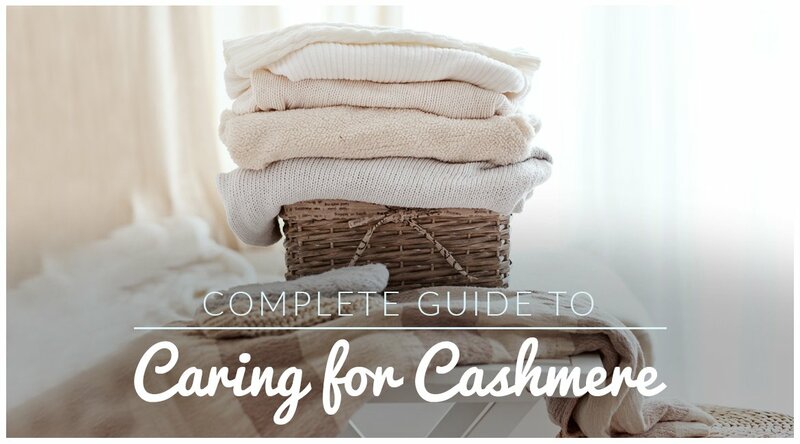 Whether you’re washing a sweater, dress or scarf by hand, these steps will help you keep your cashmere fresh. Fill your basin with cold water, and add a mild detergent such as Woolite, baby shampoo or dish soap. Let your cashmere soak in the basin for five minutes, before rinsing thoroughly. Take out your clothing and fold it up into a ball to get the excess water out. Don’t wring your cashmere, which can stretch out the delicate material. Place your clothing flat on a towel, and roll it up to remove any remaining water. Lay your clothing on a drying rack. If you don’t own a drying rack, place it between two towels to dry. Don’t have the time to wash by hand? This might surprise you, but you can use a washing machine to clean cashmere. Put the garment in a laundry or mesh bag before you place it in the machine, and select the gentle cycle on cold water. If you’d rather have a professional do the job, dry cleaning is always a good option for your cashmere. 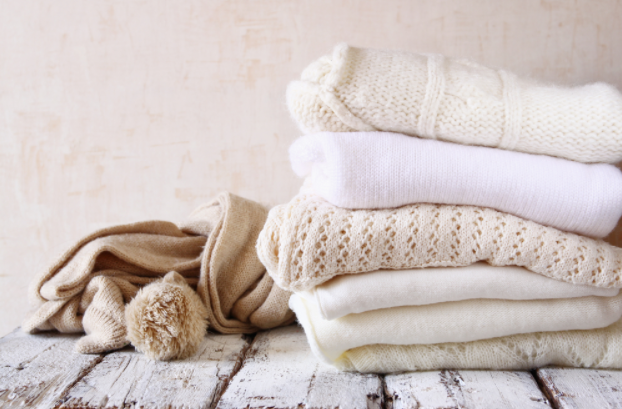 Care tip: Ideally, you should clean cashmere after two to three wears. In between washings you can remove any fabric pills with a cashmere comb or bristled garment brush. Pills don’t mean the cashmere you purchased is cheap—they’re simply a sign of friction from wear. No matter how careful you try to be, you might end up with a small stain on your sweater. Your initial urge might be to panic, but you can keep your cool—and your cashmere—by following our handy stain removal advice. Makeup or grease-based: First blot the stain. Then, pre-treat by soaking the cashmere in mild shampoo. Chocolate: Dip a cloth in liquid detergent and lightly rub the stained area, taking care not to scrub too hard. Red wine, tea or coffee: Gently rub the stain with a cloth dipped in a mix of cold water and dish-washing liquid. Avoid soap or machine detergents, which can set red wine stains rather than remove them. Afterwards, rinse your garment in cold water and let it dry on a rack. Your cashmere should be as good as new! To keep your cashmere looking its best, keep these tips in mind. Don’t hang your cashmere sweaters or dresses. A hanger will distort the shoulders, and the garment will lose its original shape. Instead, fold your cashmere and keep it in a drawer or on a shelf away from moisture. When you’re putting your cashmere away for the season, place it in a breathable garment bag or storage box in a cool, dry area. To prevent wrinkles, you can wrap each piece of cashmere clothing in acid-free tissue paper. Remember to make sure your cashmere is washed before you store it for the offseason. Moths are attracted to human scents, so you’ll want to get rid of any perfume or food odors prior to storage. As an added precaution, place some cedar wood moth repellents with your cashmere. Now that you’re fully equipped to care for cashmere, go ahead and stock up on this comfy and luxurious fabric in time for sweater season. You’ll look good and feel good! I love my Jeans! How long will they last?